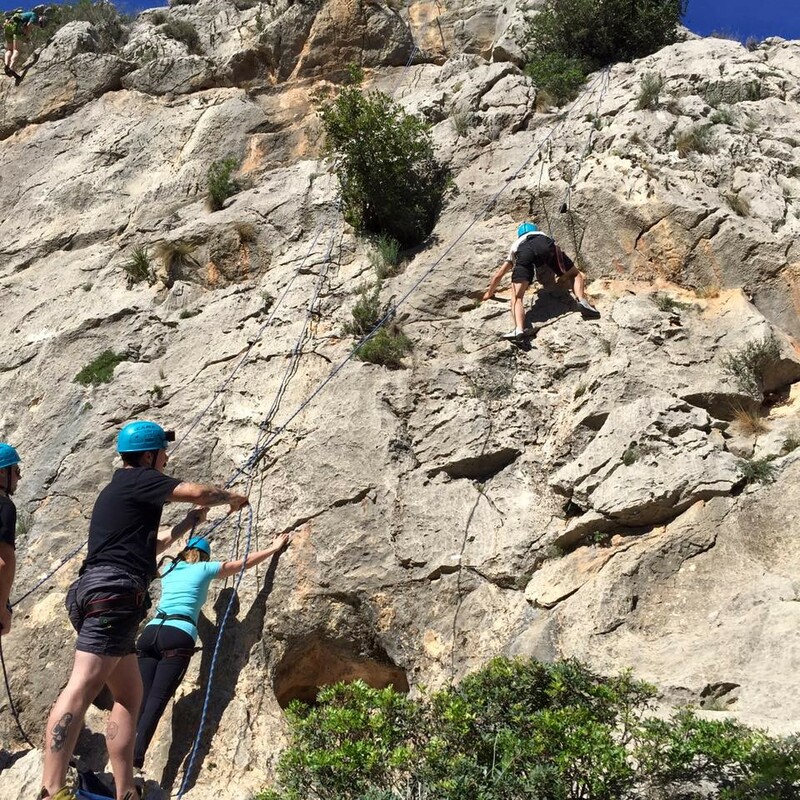 On 24 Oct 15 ten personnel from 75 Engineer Regiment left Manchester and travelled to Costa Blanca, Spain for a week of climbing the stunning limestone sport climbing routes which populate the area just North of Benidorm. The week’s aim was to introduce novice climbers to the sport with the long-term aim of them continuing with the Joint Service scheme eventually becoming instructors. In addition to this the week would provide the Regiment’s current instructors with more experience. The group flew from Manchester to Alicante, taking over hire vehicles and then moving to The Orange House, Finestrat; the accommodation for the week. The first morning the group sorted out their equipment while the two instructors went out to recce the routes to the climbing areas they had chosen. Once the instructors returned the whole group set out for the crag. 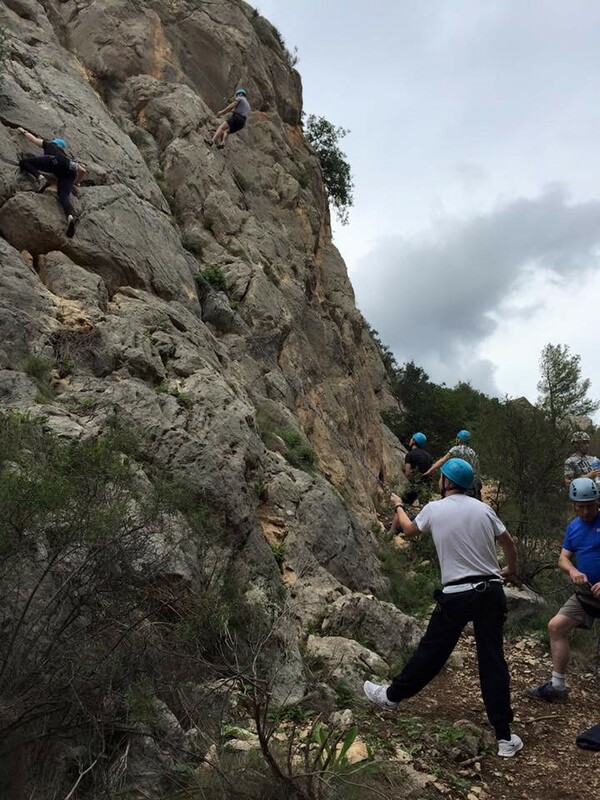 With most of the group being novices the group started at Echo Playa, a small crag with a good variety of climbs which ranged in difficulty and gave the instructors a chance to judge our levels of competence. After the first day of climbing and the inevitable tantrums when being lowered off the group moved to Echo 1.5 for the second day. Although another small crag in the Echo Valley this area offered a much better selection of climbs which were achievable for the group but would also be challenging. This area also gave great views down towards Benidorm and the coast and although the climbs were only 12 – 14m high the fact that the crag is situated high in the hills directly over a significant section of switchbacks down the steep valley side gave a real feeling of exposure and heightened the perception of risk. By day three the sun was really out, the group were starting to feel fatigued and the instructors were bored of driving into the Echo Valley so the group moved to the coast. Sierra de Toix, just West of Calpe is an expansive section of crags, accessible along a path but located on a section of coast which juts out into the sea. 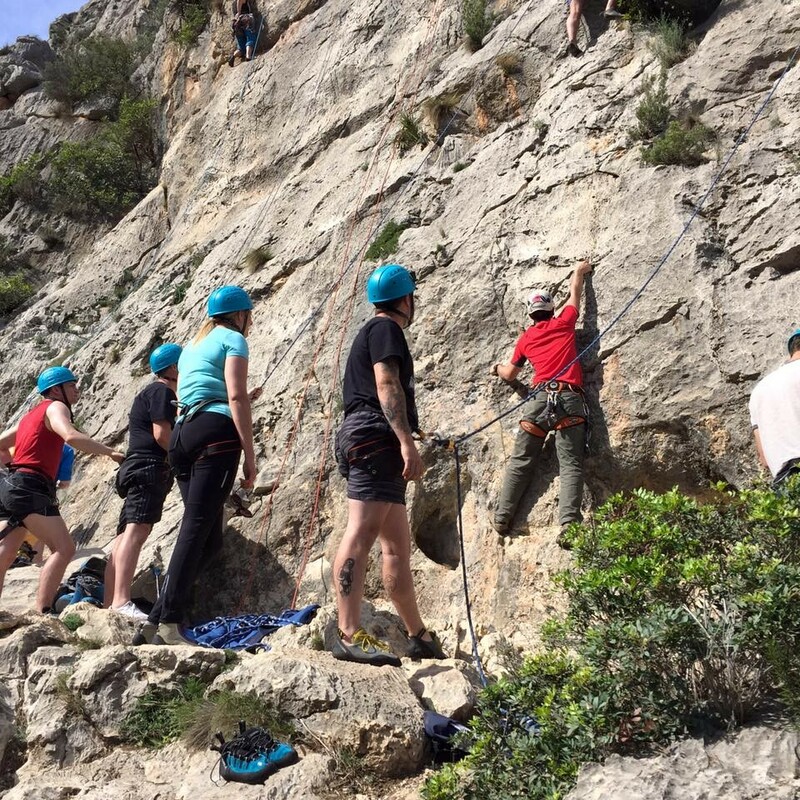 With great views along the coast and a veritable sun trap the instructors found a section of the crag with more climbs at the right grades for the group but much higher and steeper than anything the group had climbed to that point. An enjoyable day was spent pushing the group’s limits and the instructors even managed to squeeze in some education in the form of talks on the climbing equipment and its history as well as instruction on how to use a climbing guidebook. For the remainder of the week the group switched between Echo 1.5 and Sierra de Toix each day climbing steadily harder or more exposed routes, improving technique and practising placing quick draws whilst still attached to a bottom rope. In the course of the week the group also saw others climbing multipitch routes nearby and the instructors explained the principle and gave some demonstrations of some of the techniques required for these longer climbs. Unfortunately due to the instructor/student ratio the group were unable to do any multipitching. On the final day of climbing anyone who wished to was allowed to lead climb under close supervision of the instructors. This added a whole new dimension and really got the adrenalin running. To aid the transition to leading the group was taken back to Echo 1.5 and allowed to lead routes that had already climbed. 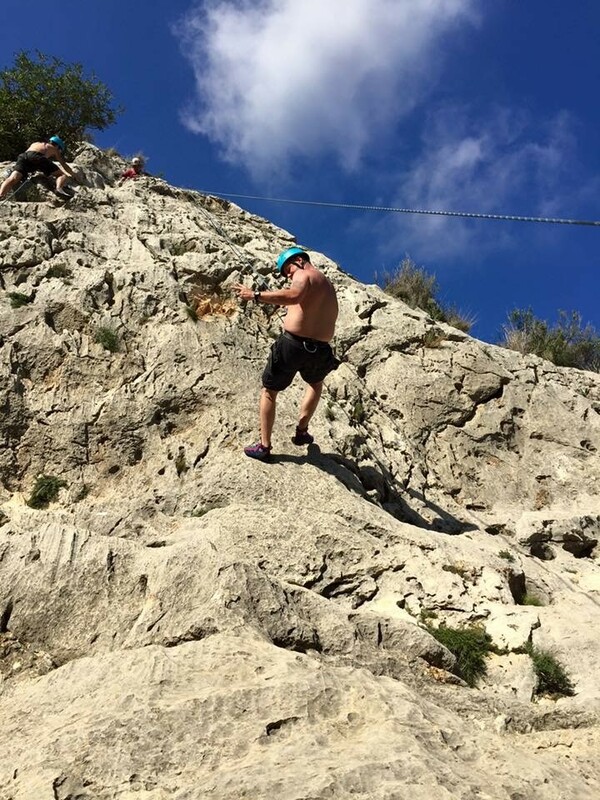 Previously, on a bottom rope, most of the group had almost run up the routes and they should have caused no problems that is until the climbers realised that the security of a rope stretched taught above them was gone. Slowing the climbers down considerably and making them really think about the climbing technique gave them a real sense of achievement from the week. With heavy hearts the group departed from the winter sun and flew back to the UK with dreams of continuing to climb in future. A challenging exercise, the aims were met and surpassed with more than half the group wishing to continue climbing and already asking about how to attend a Joint Service course. Additionally four of the group completed their first lead climbs whilst on the exercise showing rapid development as novice climbers. Working out the first moves at Echo 1.5. LCpl Sweeney moving fast on the rock at Echo 1.5. First lead climbs at Echo 1.5.